Barack Obama and the nasty forces allied with him want to attack Syria. Badly. The US military complex under his command, cheered on by its lapdog mainstream media, has leapt into mobilization, only days after a very sketchy nerve gas attack that practically screams "false flag". Never mind that the Assad regime would have known that any whiff of chemical warfare would have brought down the full destructive might of America on its head: only the rebels stood to gain from the incident. Nevertheless, the flimsy justification is enough for Obama to begin yet again what seems to his favorite activity: harming and killing. 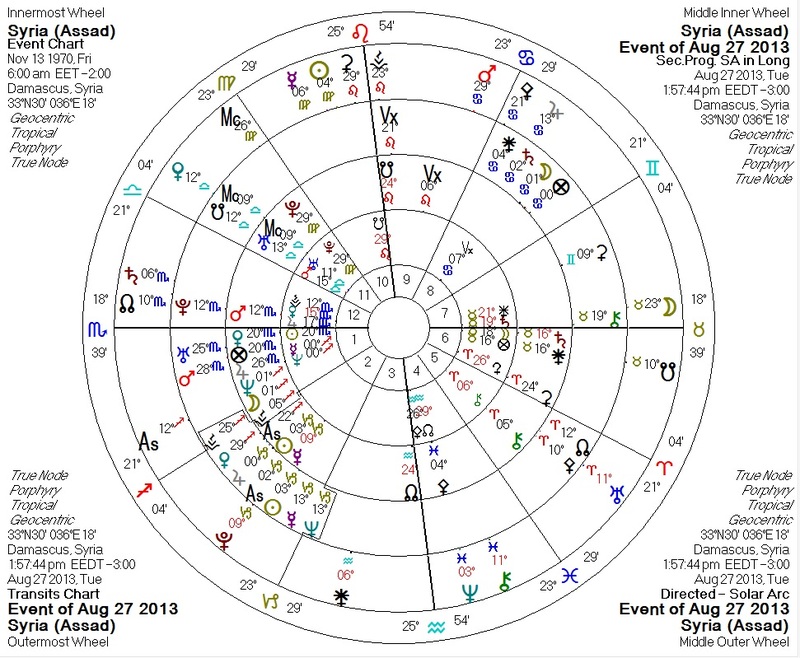 This is a chart for the Assad regime based on data from Nicholas Campion's classic Book of World Horoscopes. The chart is for the 1970 coup which put Hafez al-Assad (father of Syria's current president) in power and hence serves as a natal chart for the regime itself. It does fulfill the Bloodbath Formula for mass-murderers and mass-murder events, but is nowhere near as dark as the chart for Barack Obama, who is hell-bent on ending the regime. The 1970 coup was, interestingly, bloodless. Obama's impending military assault will be anything but. 2. Neptune indirectly/widely conjunct Venus, which is ruled by Mars (semisquare Neptune) and Pluto (sextile Neptune). 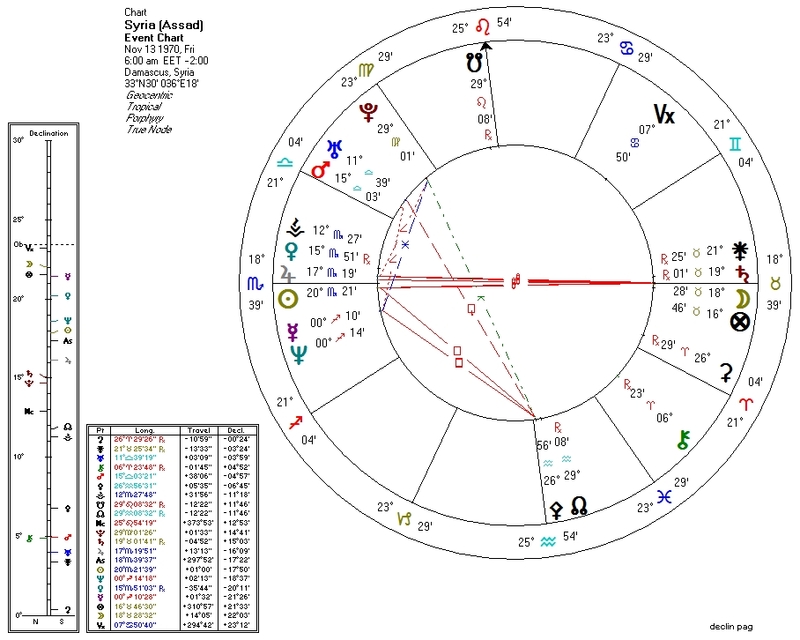 Pallas on this chart indicates authoritarian beginnings (Pluto quincunx Pallas, co-ruled by Saturn which is parallel Pluto), with a strong tendency to become more libertarian over time (North Node conjunct Pallas). Neptune indirectly/widely conjunct Venus, which is ruled by Mars (semisquare Neptune) and Pluto (sextile Neptune): economically Left-wing. South Node on IC: culturally Right-wing. This with the Left-wing economics and the authoritarian tendencies explains the essentially Fascist nature of the regime. The whole picture is that of a Fascist or Right-wing authoritarian regime which loosens over time. This is a chart including transits, progressions, and solar arc directions for Syria, generated at an arbitrary time this week. It gives us a picture of the long-term patterns in play at the moment. North Node conjunct progressed Mars and solar arc Pluto: amping-up of violent energies. Transiting Uranus in Aries opposite natal Uranus, exact: unexpected violent disruption. Transiting Pluto conjunct progressed Mercury, ruler of 8 and 11: activation of the house of death and the house of society with the energy of death. Progressed South Node (probably) on the Midheaven: loss of power and position. Solar arc Chiron conjunct natal descendant and Saturn: difficulties in relations with others resulting in wounding. Transiting Saturn quincunx natal Chiron: exacerbation of difficulties requiring healing. Progressed Venus conjunct natal Sun: this whole episode may have something to do with money. Perhaps, say, the Syria-Iran-Iraq pipeline agreement or the newly discovered Leviathan oil field. Obviously, we libertarians and peaceniks condemn the childish and destructive course of action that the Obama administration is taking. We hope and pray that the loss of life will be minimal, but harbor no illusions that it will be.